Business is on the move, and so are you. Count on this wired and wireless MFP for vibrant color printing wherever you are across the office or on the go. Keep everyone on the team connected with Wireless direct support. Accelerate office processes with versatile scanning solutions that help easily send files to their destinations. Easily send print jobs wirelessly from smartphones, tablets, and laptops no need for a router or network connection. Send scans directly to email, network folders, or the cloud. Finish faster with single-pass, dual-head scanning. Speed through tasks with a 50-sheet ADF. Up to 21 ppm black. Up to 21 ppm color. 25 to 400% copy reduce/enlarge. Designed for work teams with 3-10 users. Print speed black: Up to 21 ppm. Print speed color: Up to 21 ppm. First page out (ready): As fast as 16.5 seconds black and color. Recommended monthly page volume: 1,000 to 2,500 pages. Paper handling input, standard: 250-sheet input tray, 50-sheet multipurpose tray, 50-sheet automatic document feeder. Paper handling output, standard: 150-sheet output tray. Media sizes supported: Paper (bond, brochure, colored, glossy, letterhead, photo, plain, preprinted, prepunched, recycled, rough), postcards, transparencies, labels, envelopes. Copy reduce/enlarge settings: 25 to 400%. Over the decades HP M476nw has grown the software suite they installed with the printer drivers to the point of being huge - not even fitting on a CD, I was pleased to see the package for the M476dw is significantly more compact and focused than the time I installed another HP multifunction about 2 years ago. It is still a big install, but not so huge as in the past. It provides for setup and operation of the printer, scanner and fax from our PC's. One thing I find particularly annoying is the incessant nag window to validate your toner cartridges. I hate checking in with some central site whenever I change toner or inkjet ink so I don't want to do it. It did not accept my "decline" choice and kept coming back. To scan from the M476dw console the install needs to setup scan to share. This means a shared folder and windows file sharing must be enabled which might be a security concern for some with laptops that travel to other (public?) networks. Once setup scan to network share is easy. The PC scanner control software controls don't provide much control (even the advanced controls) which I consider a negative for me. To be fair the automatic functions work well with a wide variety of printed material and photos, but not all - particularly real (as in from film) photos on matte photographic paper. I have liked the lightweight Brother suite which includes PaperPort with OCR for scanned document management. It also includes a firmware updating capability which I like as Brother does seem to keep improving their firmware. Installation is quick and use is intuitive. The control center provides a lot of control. With the driver installation on the Brother your PC is automatically registered with the multifunction for scan to PC from the MFC console. A small service listens for the scanner to initiate a scan and does not require setting up windows file sharing on the destination, but the Brother can use a network share if you want. Initiating a scan from the MFC-L8850CDW is simple and it is easy to select the destination. The photograph that gave me headaches on the HP scanned perfectly on the Brother. Both the M476dw and MFC-L8850CDW have auto-duplexing automatic document feeder (ADF) scanners which can feed up to 50 sheets. These can scan both sides of a sheet of paper automagically. Both seem to just work really well and I noticed no big difference so far. Duplex scanning is one of those things I didn't appreciate until I had it. If you scan your bills this is a big timesaver! 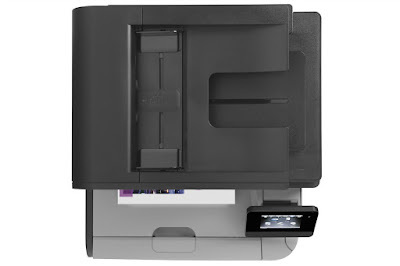 The M476dw has a letter size scanner glass (8.5X11) while the MFC-L8850CDW has a legal size scanner glass (8.5X14). While this may not affect the ADF size limits it will limit scanning one page of a legal pad on the HP. Both have comparable optical resolution of 1200x1200 for the HP and 1200x2400 for the Brother. The M476dw and MFC-L8850CDW both provide speedy duplex color printing. Both provide outstanding paper handling. The output hopper for both holds up to 150 sheets and the "special tray" (fold-out) holds up to 50 sheets. Fewer thick media like envelopes. The HP main tray will hold half a ream at 250 sheets and the Brother will top out at 300 sheets. 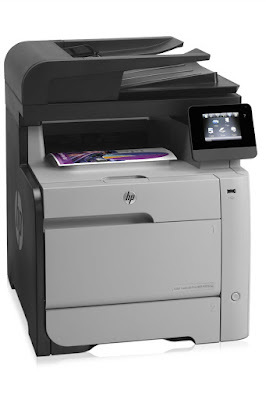 The HP LaserJet Pro prints up to 21ppm in both color and B&W. First page out is spec'd at 16.5 seconds. I find it's closer to 20 seconds most of the time from standby. It's duty cycle rated at 40,000 pages a month. Appropriate for a 20 to 50 person workgroup. The Brother is rated at 31ppm about 50% faster than the HP and that relative difference seems close to real-world. The time to first print is rated at 15 seconds, but again seems longer to me - more like 18 seconds. The monthly duty cycle is rated at 60,000 pages/month - 50% more than the HP. Output quality of both is very good indeed. Both are quite good in my opinion, but I think the HP has an edge with photo printing. If you are a real estate agent or in a business where laser printer photo quality is very important the HP will probably be a better choice. Copying is pretty much just a built-in scan to print. The copier is easy and intuitive on both. We don't do a lot of copying but it's nice to have that available. Fax setup and operation looks intuitive and straightforward with both but we do not send or receive faxes. I've setup other recent model HP and Brother multifunction units with FAX capability and on both it was easy. I've no reason to expect different here, but have not had that experience with the M476dw. The HP has a straightforward and intuitive and relatively large LCD touchscreen control panel. I found it simple to use and responsive. The Brother is comparable and also intuitive and easy to use. 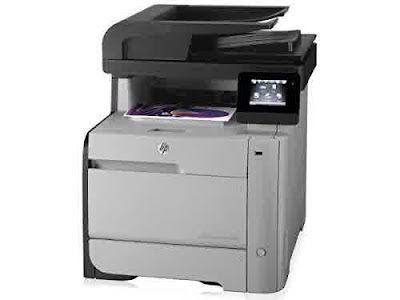 Both the HP M476dw and the Brother MFC-L8850CDW have a plethora of connectivity options. I tried setting up the wireless on both and which was very easy and worked well with our wireless N network and AES2 encryption. We mainly use wired networking here so after trying out the wifi we shut it off and use wired connections also flawless. I have an iPhone so I tried using air print to both and it worked perfectly and intuitively. HP and Brother both have proprietary apps to provide additional mobile functionality including mobile scanning. Both support printing from USB and wireless direct printing. The Brother also supports Google cloud print. 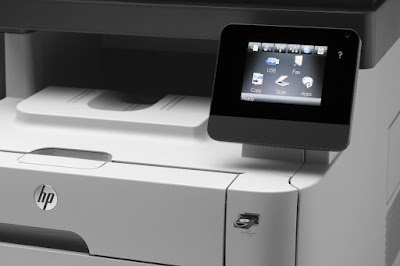 The M476dw has Near Field printing where you can tap a mobile device on the printer and print automagically. I think this may currently be a android only feature. It's very cool but there are a lot of other options too. There are a lot of ways to print and/or scan that I'll probably never use. More mobile oriented individuals or organizations will likely appreciate the diversity. From a security standpoint, if you are not using a service, turn it off. Printers can be hacked, so a little caution can go a long way.